What To Use For Toenail Fungus? 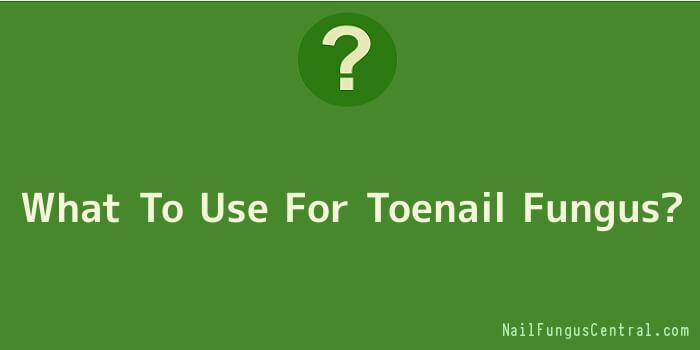 Are you confused about what to use for toenail fungus? Well, it depends on whether or not you want to use some type of prescription or over the counter type medication or if you want to stick with natural type products. Some people decide that they would rather spend their money and time testing home remedies but it’s safe to say that many of them end up back at the starting point after a few weeks. Below are a few tips to get you thinking. 1. Natural Toenail Fungus killers like Zeta Clear and Fungisil are very popular. These products are obtained by ordering online and are not available via retail stores. They contain ingredients like oil of oregano, tea tree oil, and undecyclenic acid to help stop the growth of nail fungus. 2. Prescription drugs via your doctor may be an option for severe nail fungus by using things like Lamisil tablets. Be warned that some of these drugs are quite harsh, especially when it comes to the liver. There are also some over the counter creams like Lamisil AT that you may investigate with a local pharmacist. 3. Laser toenail fungus continues to pop up as a viable option. It only takes about 45 minutes to an hour for the average treatment but the cost is a bit steep at more than $1000 per visit. The Pinpointe laser is currently the leader in the market. 4. Home remedies are not our top recommendation but they are still shared quite often via the web. Listerine, Apple Cider Vinegar, and Vicks Vaporub seem to lead the pack in getting votes for nail fungus. Be advised that any success from these is probably going to show for people with surface toenail fungus versus the more common type that is under the nail and inside your nail bed. The natural antifungal oil based products mentioned above are far more effective.